What is fibreglass roofing and why is it a better solution for my roof? Better coverage – because a fibreglass roof roof is laminated on, it moulds to intricate corners and fills gaps and surfaces that the other cannot. Improved security – intruders cannot penetrate a fibreglass roof, whereas a felt or rubber roof is opened up with just a stanley knife! The technical name for fibreglass is GRP – glass reinforced plastic. It was developed in the 1930 for insulation and has proved to be a tough, long lasting and adaptable material with many other uses. Do I need any special preparation for Fibreglass Roofing? How will my fibreglass roof look? Beautiful! Fibreglass gives a clean, smooth and consistent finish that retains its good looks for many years. Many GRP items made in the 1940s are still around today. A fibreglass product has an average life expectancy of over 50 years. 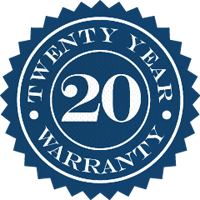 The fact that our roofs are guaranteed for 20 years does not mean you will need a new roof after that time – we expect our roofs to long outlast the guarantee. Certainly not! It costs roughly the same amount of money to install a fibreglass roof as it does any other roofing system. In fact, there is a considerable long term saving as a fibreglass roof needs a lot less maintenance and repair throughout its life. Also, as a fibreglass roof is expected to outlive other systems, it represents excellent value over the years. Click here if you are interested in Roof Repair.